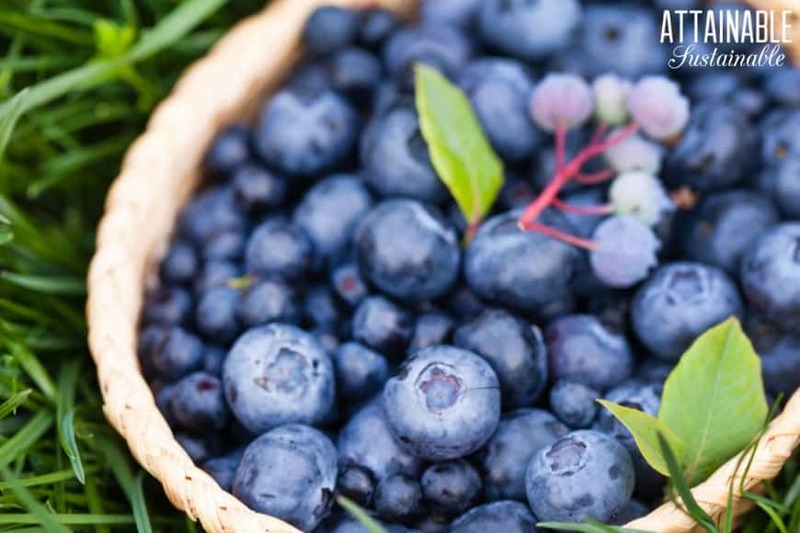 Growing blueberries in containers is a great way to produce some of your own fruit right in your own backyard. You don’t need a lot of space – they do great in containers. Plus? They’re a very pretty plant. March is one of my favorite months. 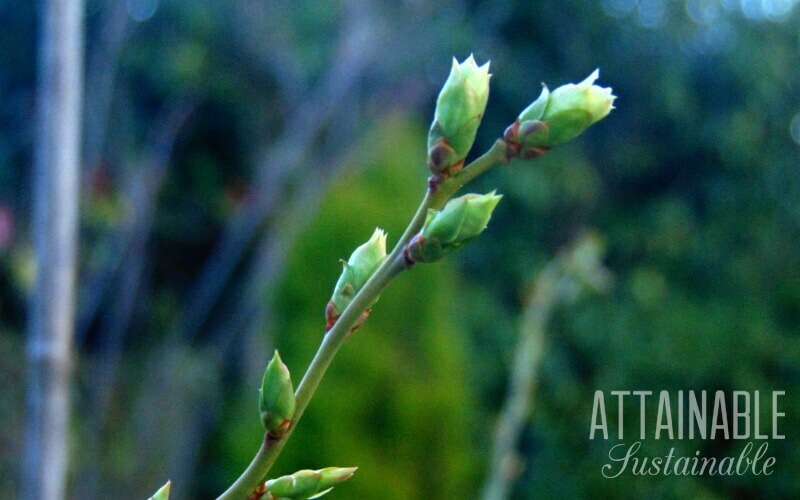 Plants are shaking off their winter sleepiness and the first leaf and flower buds are starting to swell. My marker for the start of the gardening year, along with the patches of welcome sunshine, is new growth on my blueberries. They’re one of the first plants that I learned to grow, and I’ve stuck with them year after year. 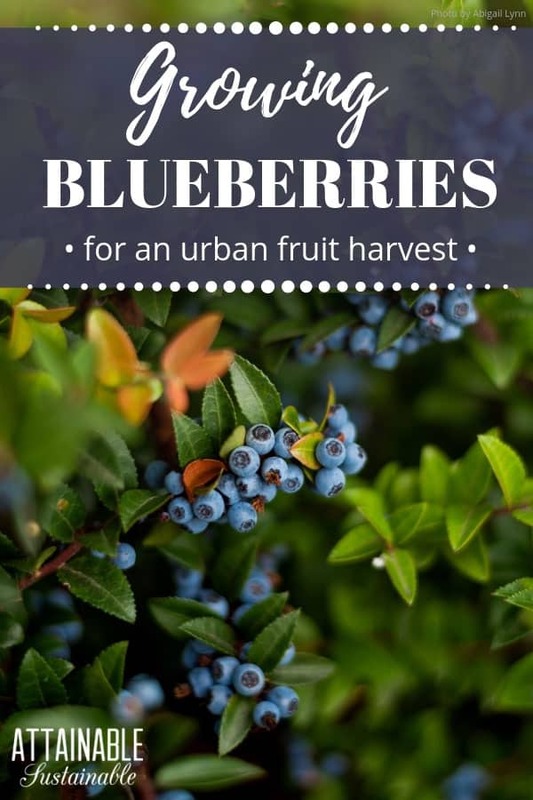 I want to share some practical steps to growing blueberries in containers for a high yield. Whether you’re gardening on a patio, rooftop, or balcony, following these universal tips will mean that you to have healthy, bountiful plants year after year. Blueberries are ideal for growing in containers. First off, blueberries are acid-loving plants and it’s easier to monitor the soil pH in a pot. Second, they’re low maintenance! A little bit of feeding, pruning and protection from birds is all they want. I always advocate for perennial crops because there’s no need to replace potting mix every year, not to mention sow new seeds. Finally, they’re pretty! Blueberries are both edible and ornamental. They have lovely white flowers and attractive red and orange autumn foliage. And then, of course, there are the beautiful blueberries themselves. Along with their cousin bilberries (that grow wild on the peat moorland near where I live), blueberries like boggy soil. It’s difficult to overwater them and important that you don’t let them dry out over the summer months. Keep the soil moist but not soaking. They’ll do best in a spot with as much sunlight as possible. Soil should be kept at a pH of 5.5 or lower when growing blueberries. Investing in a simple pH meter will allow you keep an eye on the level. Sulfur chips can always be added to increase the acidity of potting soil. Similarly, use rainwater (as opposed to alkaline tap water) whenever possible. If you only have access to tap water, you can mix in a little vinegar (about half a cup for one gallon is a good rule of thumb). During the main growth period (from about April onwards in most places), feed monthly or bi-monthly with an acidic fertilizer. 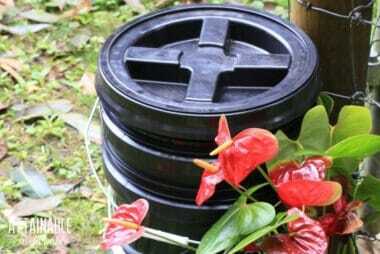 Repot plants with an acidic compost every couple of years. They’re not hungry plants so don’t overdo it with the feeding! An alternative, if you’re after the no-fuss option, is to mix in some slow release fertilizer at the start of the season. Whilst self-pollinating to an extent, blueberries will produce bigger, more abundant berries if cross-pollinated by a different variety. It takes two to make a blueberry pie! Growing two cultivars, with similar blooming times, is one of the best things you can do when growing blueberries in containers. Different varieties bloom at different times and you want flowering to occur within a similar time window. This chart from Fall Creek Nursery (who specialize in growing blueberries) is a useful tool for choosing varieties. Because blueberries are keen on moisture, it’s beneficial to add some water-retaining materials to your potting mix. 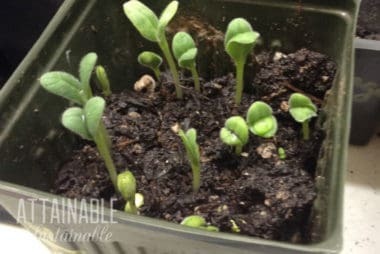 Vermiculite is a good option, as are both peat and coir. Blueberries ripen through midsummer, turning from green to dusty blue. Harvest freely throughout this period. As a general rule of thumb when growing blueberries, hold off on pruning for the first year or two. After that, you’ll notice that branches and side-branches can quickly organize themselves into a tangled mess. When pruning, which should be done in late February or early March, stick to branches that are dead and those with mostly vegetative buds, not flower buds. 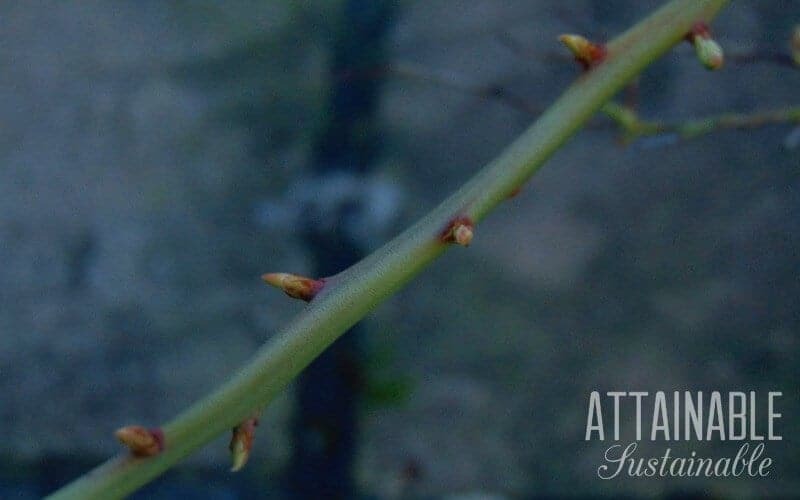 Leaf buds, which look like small spikes (above), can be distinguished from the bigger, swollen buds that will unfurl into flowers (below). Blueberries are relatively trouble-free, but I probably don’t need to explain why birds are the number one enemy! The best thing you can do to stop those pigeons and bluebirds from eating your berries is provide some kind of netting protection. You don’t need a full-blown fruit cage, but some mesh hung over bamboo canes in pots (or a similar contraption) should do the job. There can also be problems with aphids and powdery mildew when growing blueberries in containers (or in the ground), which will present itself as white fungus. Prune out any affected foliage. Dan is a container gardener with an interest in leafy perennials and unusual fruit bushes. He lives by the mantra, “If you’re not killing plants then you’re not stretching yourself as a gardener,” mostly as a way of easing his conscience. 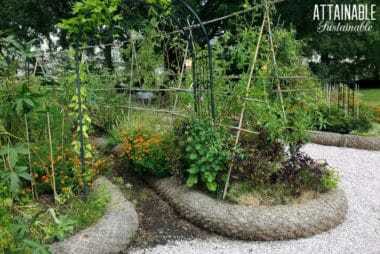 You can read about his growing efforts at his blog Urban Turnip. I live in northeast Nebraska, can the potted blueberry plants survive our winter without extra insulation or moving the pots indoors? What would be the best winter prep for them? I’m not a whiz on all of the different zones. Do you have a cooperative extension office in your region? Their master gardeners might be able to answer that! What size containers do you recommend, especially if you are using two different varieties ? The varieties shouldn’t matter. I’d use at least a 5-gallon container for each plant. More space would be good if you’re growing varieties that get quite large. 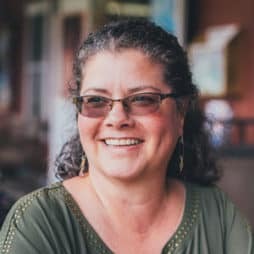 Do you know if it’s possible to grow blueberries in the tropics(Puerto Rico)? There are some varieties being bred to grow in Florida. Those might! How do I over winter them. It gets as low as 40 below Celsius in Thunder Bay Ontario. We have wild blueberries everywhere in the bush but not in the city.